The government’s efforts to reclaim the occupied waters in the name of ecological restoration mean an uncertain future for each of the hardworking families, who cannot be sure if the promise of social housing will be kept. These women have already been through damming experiences that led them to live on the Bay in the first place. Geni does not want to budge as moving into the social housing development will take her farther away from her work. Jesus spends her days cleaning clothes for the little funds she can muster as her 15 year old daughter Rafaela lays on the couch, pregnant and without the support of the baby’s father. 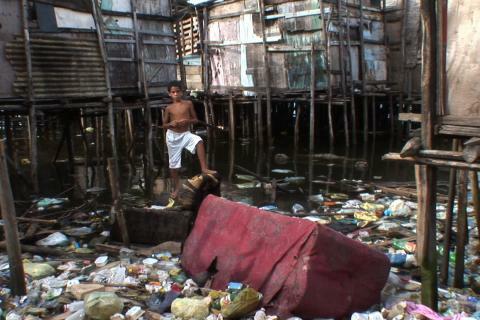 Dona Maria is a widowed mother of 19 children, 15 of which are still alive. She is literally the little old lady who lives in a shoe from the nursery rhymes of old. The camera follows Norato as conditions deteriorate and palafitas rot and fall apart. These women know Norato so they open up on camera and talk about their frustrations and desires to leave, waiting on the very hand that meant to move them before that they violently opposed. Director Eastman manages to stay completely behind the camera and away from the situations as Norato asks the questions and drives the story for her, and the film is a stronger document for it. There is very little staging here, most of the film feels very natural, as we wind down the narrow walkways of planks between the shacks, in and out of the lives of the people there. In the end all three women end up in vastly different areas. As anticipated the government agency hasn’t fulfilled its promise to build better housing, but instead has decided to do exactly what the bay residents have been doing for years, fill in the bay. 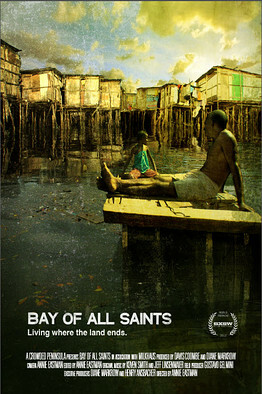 Compelling and fascinating, Bay of All Saints has a strong sense of what it intends to show its audience and the journey takes no false steps. The lives of these ladies are well worth your time and I give Bay of All Saints a solid recommend.